This simple-to-do Easy Christmas Crafts Paper Doily Cone Ornament takes just a few minutes from start to finish. This version (my favorite) used an 8-inch paper doily, green ribbon and corresponding green candies. On the Easy Christmas Crafts Paper Doily Cone Ornament page we show the materials and tools (simple and inexpensive) along with the easy steps for making this pretty little ornament. Our examples were made using 8-inch and 10-inch white paper doilies, but you could easily use gold and silver doilies and larger doilies as well. Smaller doilies do not work as well as the cones become too small to hold anything – though 6-inch could hold one or two candies. Of course, this Easy Christmas Crafts Paper Doily Cone Ornament can also hold small gifts that can be hidden among the upper branches of the Christmas tree. They can also hold other types of gifts – promissory notes – which we discussed in yesterday’s post. These pretty little paper doily cones could also be made to hold party favors for guests at a holiday party. A special tree for party favors could be set up for guests to select. Or, with the addition of a place card, the paper cone ornaments can be added to the place settings at a dinner party. Remember, gifts and party favors do not need to be expensive to be meaningful. The news today claims the traditional holiday shopping weekend after the Thanksgiving holiday last week saw an increase in the retail sales over the last couple of years. It will be interesting to see if the same holds true for today’s Cyber Monday sales on the internet. Regardless, many people still struggle with their finances in these tough economic times and struggle with how to buy holiday gifts for all of the people on their list this year. Handmade gifts are nice. We offer several different projects on our main www.funEZcrafts.com site for fun and interesting gifts. But, perhaps in addition to lack of discretionary funds, you lack the time to make gifts for everyone on your holiday list. Have you though of gifting your skills and time to help your family and friends? Maybe you think you don’t have skills that people on your list need. In many cases, it’s not always a skill someone needs. Your time and efforts helping them do a task they can’t do by themselves or helping them do something that needs to be done but they’ve put off would be very much appreciated. It’s simple to gift your time and efforts. You can write a promissory note – either by hand or on your computer – and wrap it in a gift box. Or, you can add the gift as a decoration on the tree. We have several ornaments that would be easy to make and add to the tree with a promissory note inside. 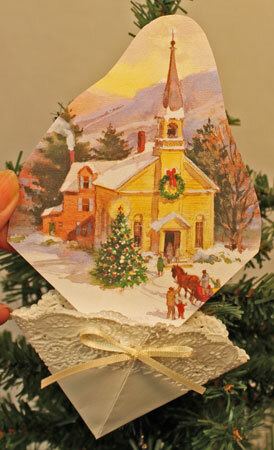 Our Paper Doily Greeting Card Ornament could just as easily include a note with your promise of time and effort. 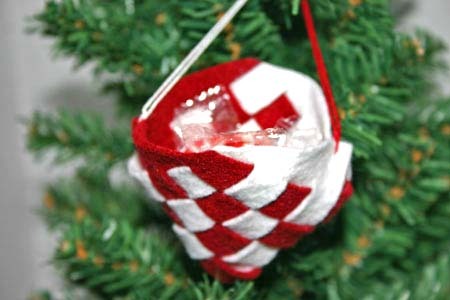 Another easy ornament, the Paper Basket Cone Ornament, would also hold a rolled promissory note. A similar version made of felt can be used instead. Children, young and not-so-young, can get into the spirit of the season by making these ornaments and adding their own promises as gifts. They could have fun making the ornaments while they learn the spirit of giving and the responsibility of following through on their promises. The list is endless and should be applicable to each child’s abilities and the family’s interests and needs. The promise should be worthwhile and not something they would be doing anyway. On an adult scale, the promises could be doing tasks for someone, going somewhere with someone, and they can even be risque between consenting adults! Don’t let the holidays become stressful. Use them to be creative and to give gifts worth more than money can buy to the recipients on your list! A fun and easy Christmas Tree! 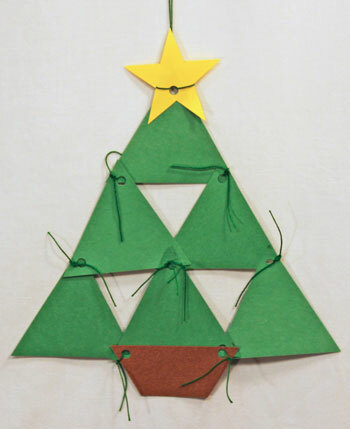 Take a look at our Easy Christmas Crafts Construction Paper Triangles Christmas Tree. It’s simple. It’s fun. It’s inespensive. And, it adds a bit of fun to the holiday! Children can have fun making these simple trees and have even more fun coloring decorations on the tree. The simple instructions, pattern and pictures showing the steps can be found on our Easy Christmas Crafts Construction Paper Triangles Christmas Tree page. Have fun making these fun and funny little Christmas trees! A simple paper doily, a Christmas card and two pieces of ribbon are all you need to make this pretty and Easy Christmas Crafts Paper Doily Christmas Card Ornament. The simple yet interesting ornament showcases the cards you receive. Or, perhaps you have some cards that would add pretty decorations to your home. Our Easy Christmas Crafts Paper Doily Greeting Card Ornament page lists the materials and tools, the how-to instructions and provides pictures showing the steps. It’s fun to figure out which part of the Christmas card to show inside the paper doily. The part showing above the paper doily can tease and entice for seeing more of the scene. The Easy Christmas Crafts Paper Doily Greeting Card Ornament is fun, fast and inexpensive to make. A few can fill in the bare spots on a Christmas tree. They can decorate a mantel. Or, they can highlight a doorway. 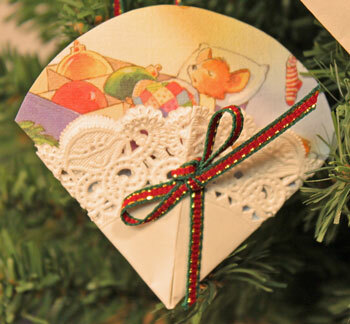 Use your imagination to find ways to decorate with the Easy Christmas Crafts Paper Doily Greeting Card Ornament! Isn’t she pretty with her golden wings and curly golden hair? She can also stand on a mantel, a table, a sideboard or hand on a door knob or in a window. In other words, she’s versatile and can add some whimsey where ever you want an angel to be. The materials and instructions are easy. You can find them on our Easy Angel Crafts Spiral Wire Angel Ornament web page. We outline all of the materials and how-to steps with accompanying pictures. We also suggest alternative wire if you cannot find the natural covered floral wire shown here. The natural covered floral wire can be found in the floral area of craft stores. It’s inexpensive. One roll of the wire will make many of the Easy Angel Crafts Spiral Wire Angel Ornaments. Several made of slightly different sizes and shapes of the spiral could decorate a tablescape for a dinner or stand among greenery above a fireplace. The Easy Angel Crafts Spiral Wire Angel Ornament is fun, easy and inexpensive. This pretty little Easy Christmas Crafts – Spiral Beaded Christmas Ornament can be make quickly and easily using inexpensive beads, wire and ribbon. We like to purchase inexpensive beads found in quantity or by weight from discount or craft stores. Using a few zippered plastic bags, we separate the beads into colors and styles for future projects. 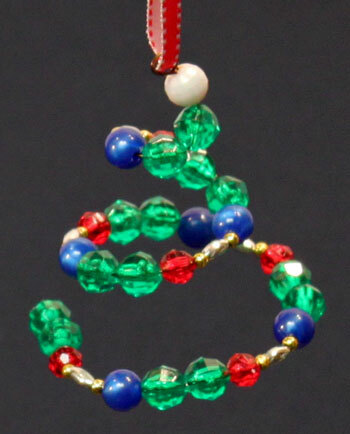 On our main Easy Christmas Crafts Spiral Beaded Christmas Ornament page, we show the materials and tools and each of the steps to make these pretty little ornaments. Each of these can be made quickly and easily. These pretty little decorations can be added to the Christmas tree or as an additional little remembrance on the outer wrapping of gifts. They would also add sparkle to place settings at dinner parties and be a small gift for guests to take with them. 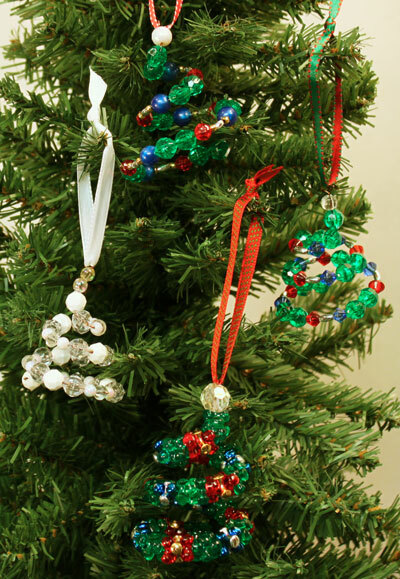 With the variety in beads – colors, sizes and shapes – along with the variety in ribbons, many of these Easy Christmas Crafts Spiral Beaded Christmas Ornaments can be made quickly and uniquely. 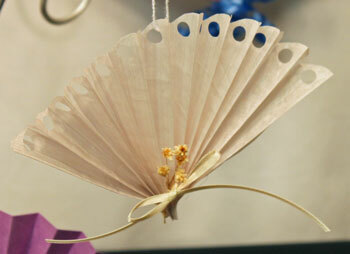 Last week we showcased the Paper Doily Flower Ornament. 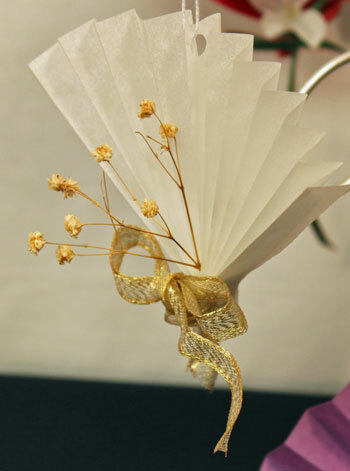 Today, let’s take a look at a similar decoration made with lace – the Lace Flower Ornament. 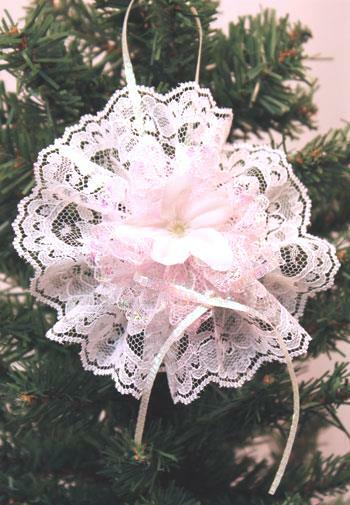 Two short pieces of lace from 16 inches to 20 inches long – one roughly half the width of the other, two short pieces of narrow ribbon and an optional embellishment for the center of the flower are the main materials for this simple lace flower ornament. Now, this ornament does require some simple sewing – very simple sewing – to make the circles of lace. A few of these pretty decorations would add interest to a Christmas tree, a wrapped package or even hanging on a drawer pull. One or more would also make nice yet inexpensive gifts for several of the people on your list this year. 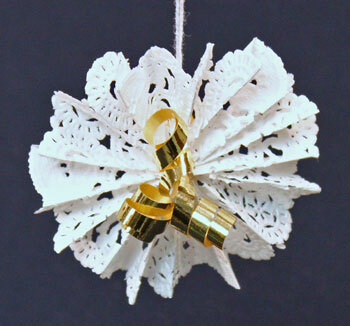 Take a look at the Easy Christmas Crafts Lace Flower Ornament page for the details. Five Point Wooden Star – Easy! 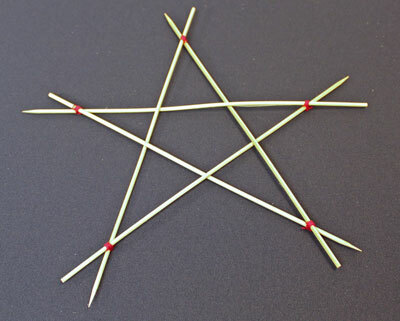 We made our Five Point Wooden Star out of wooden skewers found in the kitchen, but any five pieces of wood of roughly equal size and length would work. The larger star shown above can be woven such that all you need is string to hold the pieces together. Smaller stars require an additional bit of glue at the interior cross points. These simple stars could decorate a holiday tree, surround votive or pillar candles on a table or mantle, become napkin rings or add a bit of interest to wrapped gifts. Take a look at the easy directions with their accompanying pictures on our main page for the Easy Christmas Crafts – Five Point Wooden Star. 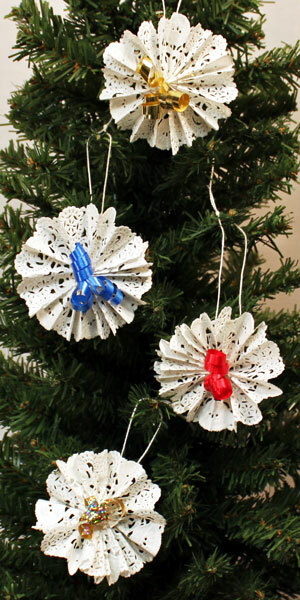 This Easy Christmas Crafts Paper Doily Flower Ornament looks pretty hanging on a tree. These were made using 6-inch diameter paper doilies, a few short pieces of ribbon and some yarn. Don’t they look delicate? 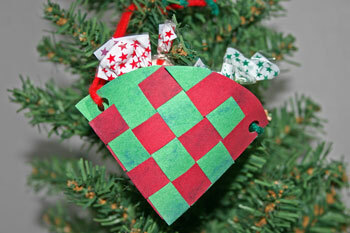 These pretty ornaments are easy to make and use only inexpensive materials and tools. Here’s an up close view of the one we make in the instructions on the Easy Christmas Crafts Paper Doily Flower Ornament page. 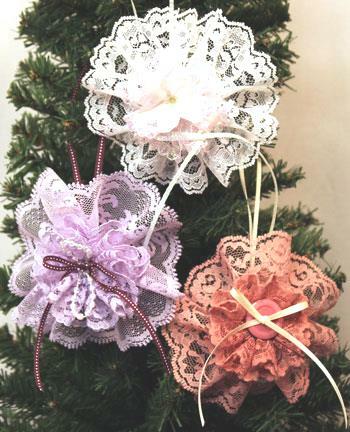 These simple and pretty paper doily flower ornaments can also add decoration to a wrapped gift. They can also be a place card decoration with the simple addition of a name tag for a dinner party. Your guests could take their decoration home as a simple yet pretty ornament for their Christmas trees. 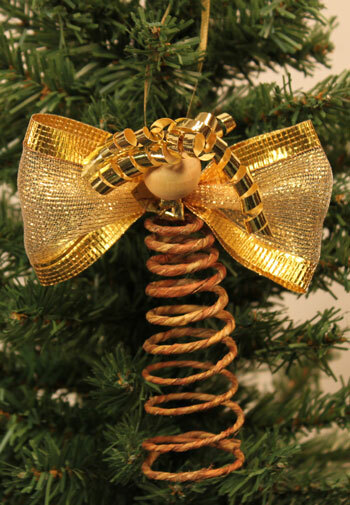 Use different ribbons to make a variety of these fun ornaments! Oh, for another variation, split the ribbons after they are curled. You will find the step-by-step instructions accompanied by photographs on our Easy Christmas Crafts Paper Doily Flower Ornaments page. 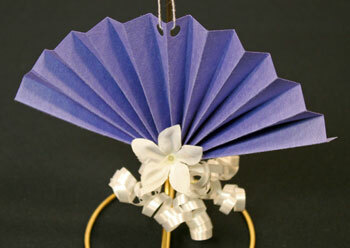 Take a look at our Easy Christmas Crafts Construction Paper Fan Ornament. It’s simple. It’s inexpensive. And, it’s fast. 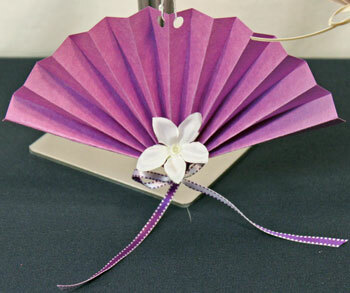 Our first version of the Easy Christmas Crafts Construction Paper Fan Ornament is purple embellished with a simple artificial flower and 1/4 inch purple edged ribbon. The next version uses a different type of paper – tracing paper – and is embellished with gold wired ribbon and dried flowers. 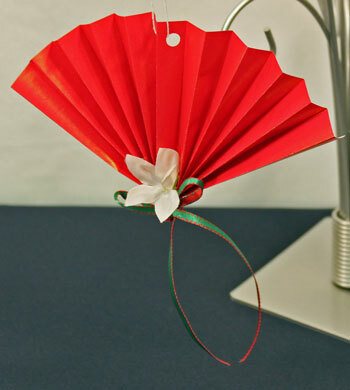 The next Easy Christmas Crafts Construction Paper Fan Ornament used glossy tissue paper with a simple flower and ribbon. In addition, the top edge was curved and holes punched to add further interest. These simple and versatile Easy Christmas Crafts Construction Paper Fan Ornaments are inexpensive and fast to make. They also would make great place cards for a dinner party. And, they would add interest to a prettily wrapped gift. 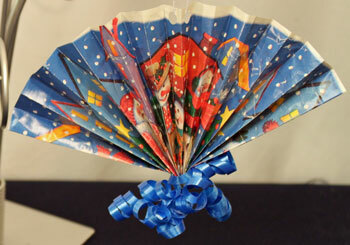 Have fun making these Easy Christmas Crafts Construction Paper Fan Ornaments.